The crowded conditions in front of 1070 Mokulua Drive in Lanikai highlight complaints about lack of parking in the area because of homeowners planting trees or placing other obstructions along unimproved sidewalks. However, the city says such areas are not meant for parking. The owners of properties at 1405 and 1053 Mokulua Drive have city-issued permits allowing the planting of trees fronting their properties. Meanwhile, the inspector said the trees fronting 1070 Mokulua were planted by the city. 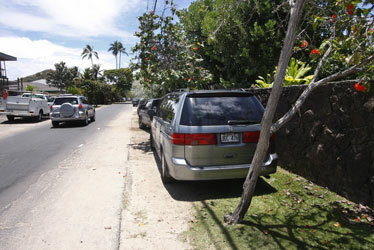 Question: Regarding your April 29 column about people being ticketed for parking on the unimproved sidewalks in Lanikai: Many homeowners have claimed the unimproved sidewalk areas adjacent to their property as theirs by planting trees or fencing the area off. It's only gotten much worse since then. As a result, when beach-goers try to find parking, the adjoining landowners call police and claim illegal parking. The police understandably have their hands tied and issue tickets. These rich property owners can't have it both ways. Either it's an unimproved sidewalk or it's not. If it's a sidewalk, then it needs to remain free of trees, large boulders and chained areas. While those who block driveways should be ticketed, the rest of us who simply want access to the beach should stop being harassed and ticketed. It's the property owners who should be cited and not the rest of us who simply want access to our public beach. Shame on the city for turning a blind eye to this matter. Answer: You won't be pleased with the answer to your complaint that a sidewalk needs to remain free of trees, large boulders and chained areas. Taking that a step further, the city says sidewalks, including unimproved sidewalk areas, are not really meant for parking, either. An inspector with the city Department of Planning and Permitting's residential code enforcement branch checked out the areas you flagged with photos. The owners of properties at 1405 and 1053 Mokulua Drive have surface encroachment variance permits, issued by the department, allowing the planting of trees fronting the properties. However, the owner of the property at 1368 Mokulua did not have a variance, so a notice of violation was issued. The owner had to either remove the trees or obtain a permit to retain them in the public right of way. Meanwhile, the inspector said the trees fronting 1070 Mokulua were planted by the city. You also sent a photo showing metal posts in the ground with a chain connecting them. However, the inspector did not see any poles and chain at the time of his visit. Instead, he saw wooden stakes with yellow flags stuck in the ground, for which he said a previous inspector had issued a citation. Property owners in any neighborhood might want to prevent people from parking in front of their homes, but they cannot do so with plants, trees, rocks, stakes, poles, concrete blocks, construction cones or any other obstruction, the inspector said. However, they may obtain a Sidewalk Surface Encroachment Variance to plant trees. The sidewalk area is defined as the area between the paved roadway and the abutting property line; basically, the area intended for pedestrian and public utility use. We asked Henry Eng, director of Planning and Permitting, to explain reasons for issuing a variance a Sidewalk Surface Encroachment Variance and what the restrictions are. The city considers many factors before issuing such a variance, he said, including pedestrian access and safety, existing utilities and sight lines for traffic on the roadway. However, "since sidewalk areas are not intended for parking, this is not a consideration in the review of these variances," Eng said. Under the variance, owners are to remove trees when and if required by the city for maintenance and repair of utilities, etc. ; maintain the surface encroachment areas; hold the city harmless against all liabilities, including injury and death, arising from the encroachment; hold the city harmless for damages if the city needs to destroy or remove the encroachments; and disclose the variance conditions to succeeding property owners. The owners also are responsible for complying with all other code requirements and for getting permits as needed. Eng said additional conditions may be added to cover nonstandard conditions. If you think someone is illegally obstructing the public right of way, you can file a complaint by calling 768-8159.